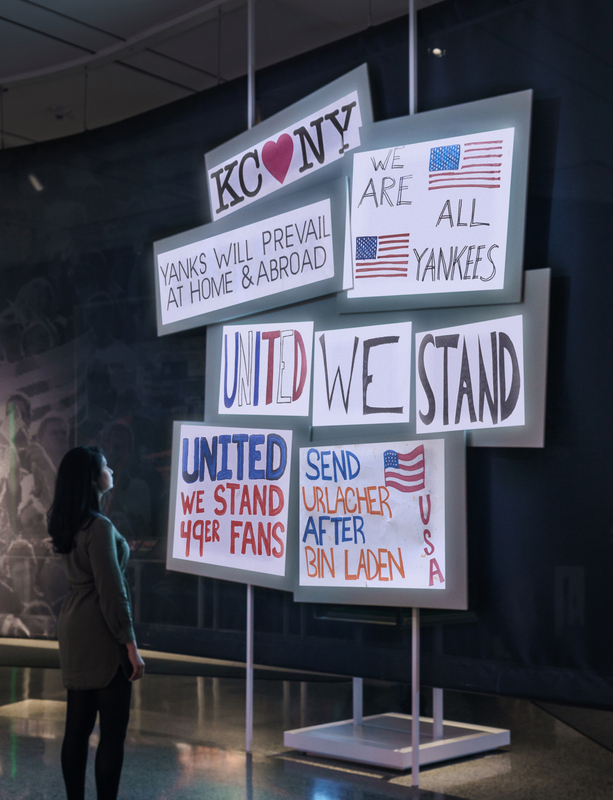 Immediately after the terror attacks on September 11, 2001, sporting events across the country were suspended as the nation grieved, with stadiums used for prayer services and relief efforts instead of games. After a few weeks, commissioners and government officials decided to recommence games, with one of the first at Shea Stadium between the New York Mets and the Atlanta Braves. 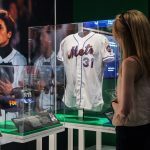 When former Mets catcher Mike Piazza hit a home run, tens of thousands in the crowd, and even more watching on television at home, truly cheered and celebrated for the first time since 9/11. From then on, sports became something that was okay to enjoy again. 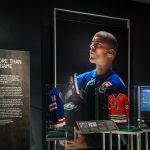 “Comeback Season: Sports After 9/11,” a new year-long exhibit at the National September 11 Memorial & Museum, examines the role of sports in helping New York City and the entire nation heal after the attacks. 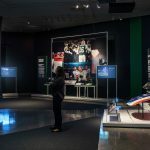 Designed by C&G Partners, the show uses the emotion of the crowd to inspire and guide the narrative, with broadcasts and sports memorabilia from that time. 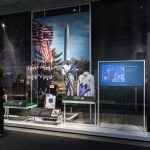 The exhibition chronologically follows what happened in sports in the aftermath of 9/11 with nine sections that look at significant sports moments. 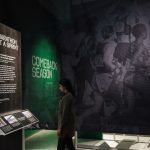 6sqft spoke with Jonathan Alger, the co-founder of C&G Partners, about the strategy behind “Comeback Season,” the importance of the color green throughout the show and the capacity of sports to do actual good. Can you tell me a bit about you got into design and how you got your start at C+G? I studied architecture, graphic design and theatre at university. And I never thought I could do something will all of those interests until I found the field of exhibition design. And I found that, luckily, when I first arrived in New York City, which was a while back. And I started working for a company that did a lot of things, one of them being exhibition design, I learned a lot. Eventually, we created C&G Partners. I’m one of the owners of that company and we started that 13 years ago. And exhibition design is one of our main areas we focus on, among other things. 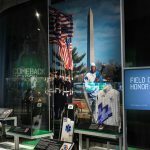 Describe the “Comeback Season” exhibit and some of the goals behind it. What did you hope to achieve? 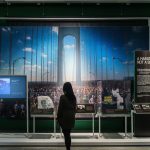 The 9/11 Memorial Museum in Downtown Manhattan is a very big museum and plaza. It has a huge underground series of galleries and halls and it’s very emotional and moving. It also gets millions of people every year, who come to visit and experience it. But it doesn’t get as many local visitors, because many local visitors don’t want to put themselves through that again. Still, even though the event is some time ago. There are a lot of people who lived through the event or heard about it or just don’t want to go there. So this new project, which is called “Comeback Season,” is in part, something for local people. 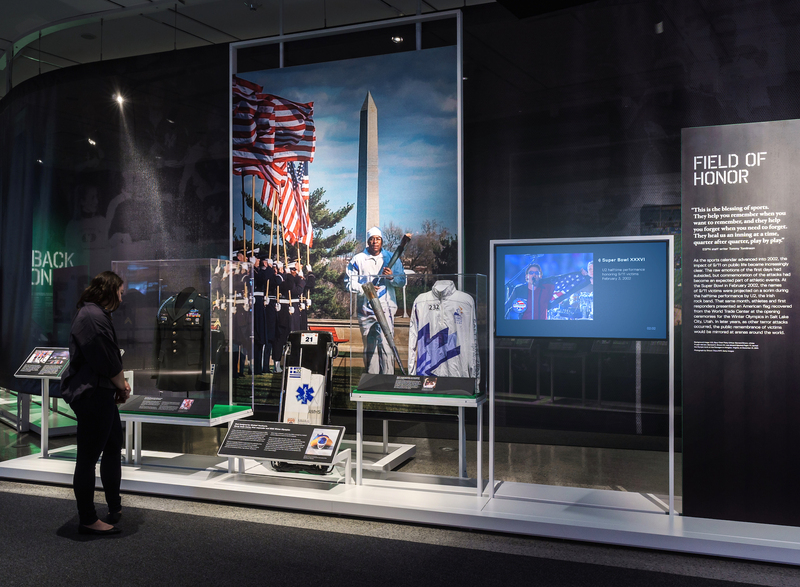 It is an exhibit that talks about the role of sports in healing the nation after 9/11. And so the tone of the exhibit is a little bit more hopeful, it’s an exhibit that allows itself to have a different kind of emotional tone. 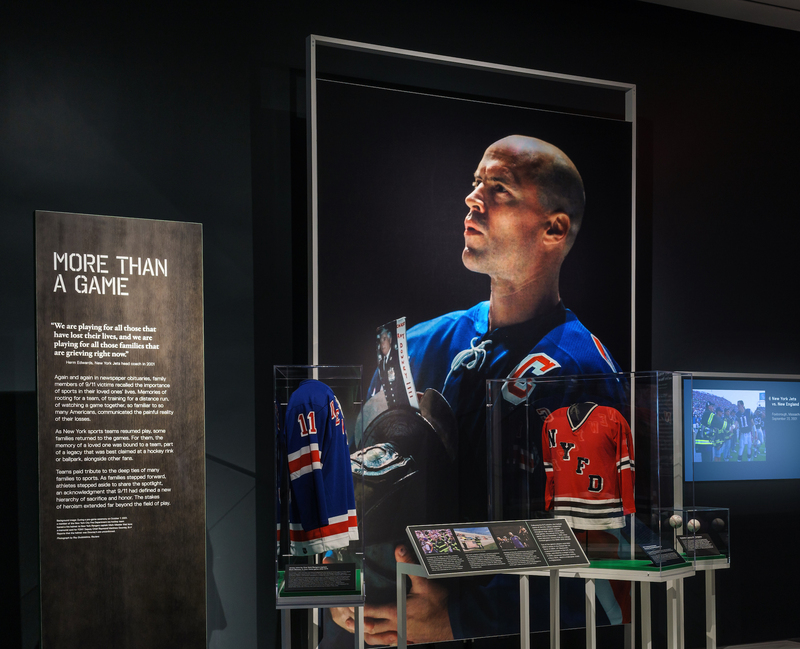 And also the exhibit profiles a lot of local sports heroes who still to this day, commemorate a loss of life among fireman, police officers and other rescue workers with just about every game. How did you come up with the nine different sections? 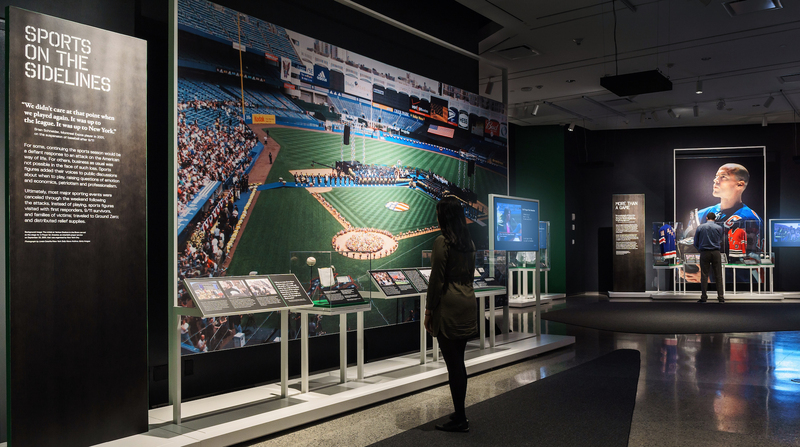 The museum–exhibition design is a collaborative design process–we’re often working with museums and curators. 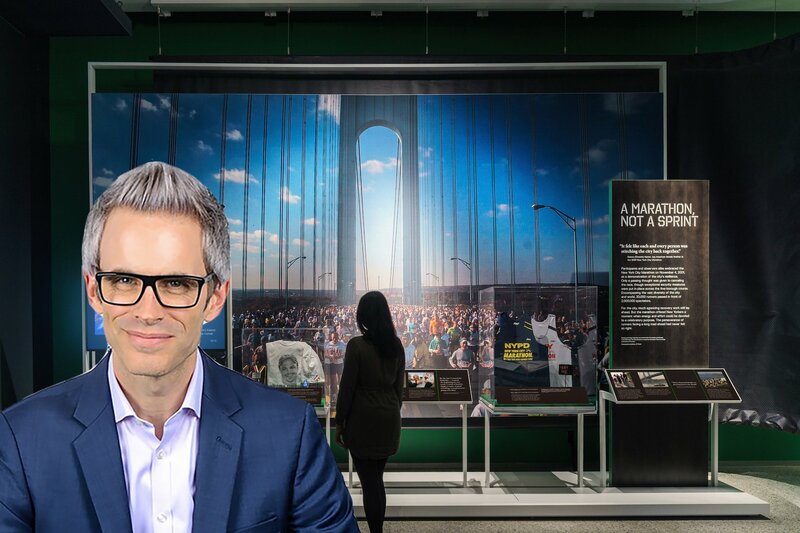 So the 9/11 museum was no different. We had an excellent curatorial staff, audio and visual experts, and others. So as designers, we’re collaborating. They already had when they hired us had been working on a script that took you through a season. 9/11, we kind of forget, that 9/11 was September 11. So September is not only a moment in time, it’s a month in a sports season. So around that time, we’re thinking about finishing the baseball season and we’ll have the World Series. We’re thinking about starting the football season. Later on, we might be thinking about the hockey and basketball seasons. And then, of course, later in November, we have things like the marathon. So the different sports have different seasons. So this comeback season idea follows the season immediately after 9/11, the fall, and goes through kind of a byproduct of that, it goes through every sport that is played in New York City. So they already had that structure. The first major sporting event that happened after 9/11 was a baseball game. And baseball games have 9 innings so we thought that was an interesting coincidence of numbers, basically. How were the sports moments chosen? We worked with the museum. But actually, some of our staff members are quite knowledgeable on this as well and worked in graduate school on this topic as well, coincidentally. So we worked together on what those moments were. Also, the museum is a museum because they collect stuff, they have things. They have objects in a collection. And those objects are historical, or significant, or everyday items, or whatever. And so the museum had certain things that had been recovered from the site, so there was a bunch of really, bittersweet and in some cases tragic, that could be put out on display. A ticket to a sports game that was never used. A program for a sporting event that didn’t happen, and instead a prayer service happened. And of course, a lot of interesting sports memorabilia related to the event. For basically all the sports, that are chronological, in all of them, in that season, and to this very day, you will see sports players wearing an FDNY or NYPD hat or shirt or badge or patch. And doing their sport in honor of someone who fell. So there was a lot of those kinds of items. 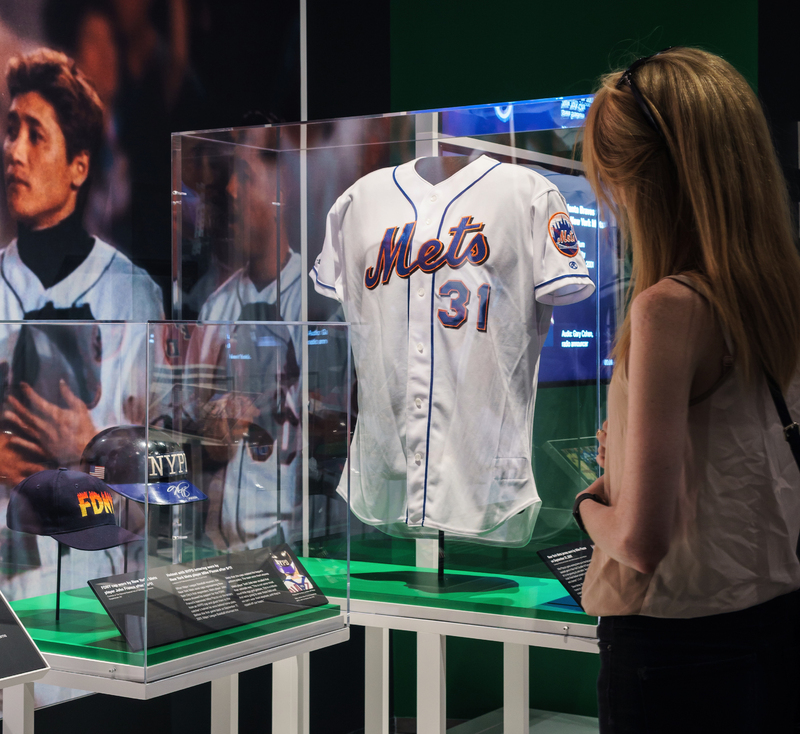 Partly, the moments were chosen around which items the museum found at Ground Zero in the wreckage. And partly, things they had researched. Can you describe what it means to use the crowd as part of the narrative? The thesis of the show is the role of sports in healing the nation. And right after 9/11, after the attack, they grounded all the planes. If you were abroad or anywhere, you couldn’t get anywhere. They also stopped all sports. Because sporting events are a security risk. Nobody knew, is this an all right attack on the United States? So they stopped all sporting events, they stopped everything. And that persisted for a while, for weeks. And then the various commissioners and leaders of the sports leagues started talking and asking the government and asking the president. So at some point, there was a decision made that the nation needs some distraction. It’s been a few weeks now. We need to get back to business, we need to show people that we are American. And American pastimes like baseball are part of that. One of the first games, there was a game for the Mets. And their catcher, a guy named Mike Piazza, a very good hitter as well. At some point in the game, he hit a home run and up until that point, the crowd was very quiet. They didn’t know what to do. They didn’t know what the new rules were. But when he hit that home run the crowd couldn’t help themselves. They all automatically jumped up and started cheering and smiling and celebrating together, as a group of fans who all had one thing in common. And from then on, sports became something that was okay to do. And sports became something to distract you. Sports became something you felt safe doing in groups of tens of thousands of people in public, all together in a big building. So the emotion of the crowd is the key ingredient for the whole show. There’s crowd sounds recorded from the time, contemporary broadcast media throughout the whole show, every one of the exhibit stations had a broadcast media of the time, sports figures, sports commentators, the major networks all talking about the event and how sports had some connection to it. And all throughout, the emotion of the crowd is the guideline. So at the very beginning of the show, it’s all about silence and the absence of crowds. Because all of the sports stadiums were closed. Then stadiums started being used to stage rescue operations, they started being used to host prayer services. Then, slowly, they became used to have games. And from then on, people were able to become more and more excited. 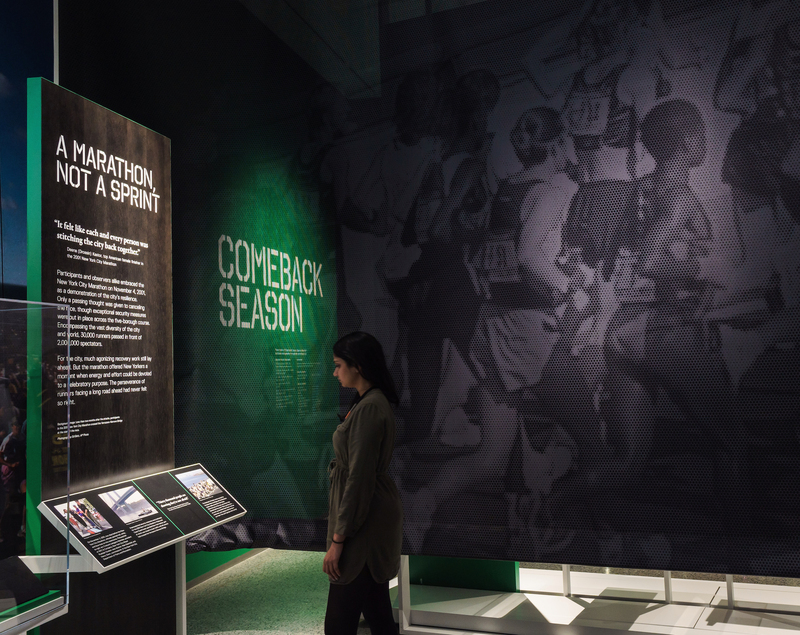 By the time you get around to the New York Marathon, which is the last game chronicled in the exhibit, you have those same tens of thousands of people, except they are the athletes now. And instead of going to the stadium, they’re retaking all of New York City. And that was an event that was much debated. Because that was less than two months after the attack, so should it happen at all? Just opening up a big security risk. What happens to New York City if there’s another attack? Won’t we be held responsible? The decision was made to do it. And you know, tens of thousands of people came out. And they ran with determination and happiness and fury and everything and did it. And that’s the end of the exhibit. Really it’s about the arc of emotion, not a person or a story, but of tens of thousands of people all at once. The emotion of the crowd. 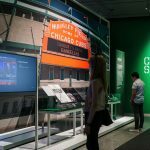 Can you talk about the importance of the color green in the exhibit? 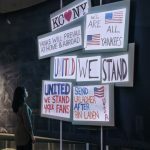 The 9/11 museum has a very solemn and important mission, which is to recognize and commemorate, the lives of the fallen in the attack. They also explicate what happened with exhibits and programs. It’s a very serious, very tragic, very grim memorial mission. It’s essentially a grave site. The color green was important to us because we felt you could take with this particular topic, with great respect to the fallen and great respect to their families, you could bring a little hope into the project. Not to say the event didn’t happen at all, but to say what happened after the event. So green symbolizes the green of the baseball field, the football field. It also symbolizes to some degree for us, some of the early pictures of 9/11 a few months later, out of the rubble, a little green shoot, a green piece of grass or tree started to sprout again through the rubble. So we asked to use a little bit of actual color for this exhibit, and we were given that, and I think it works pretty well. Because these events in sports, also genuinely did happen. And in many cases, the family members of those who fell were involved in the sporting events. 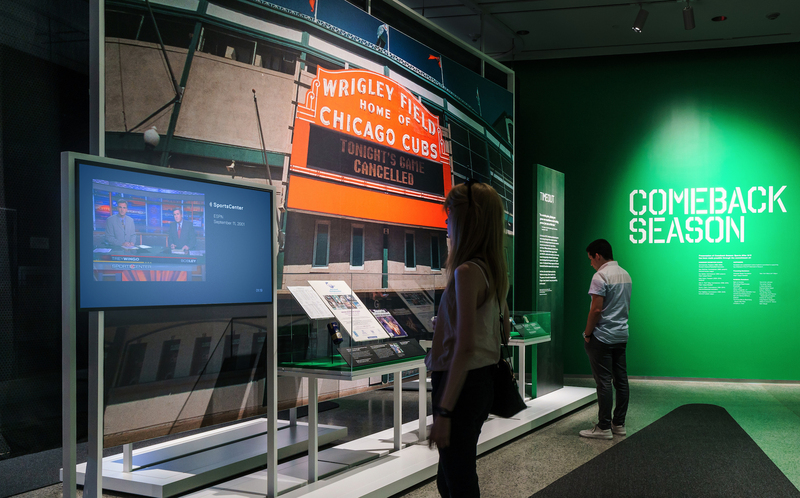 What do you hope visitors get out of the exhibit? Well, first I hope they enjoy it and remember it and it gives them another way to think about that event. But I hope people also realize that there is a lot more to a story than you think. 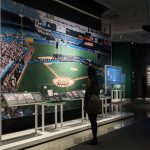 We all think that sports are entertainment or something to pass the time, but in fact, sports, like a lot of other things, is more than you think. We’ve seen lately that sports, the NFL, that’s become politically charged, with players taking a knee. We see that stuff playing out when you watch the World Cup, you see politics. So, like a lot of things, sports is more than you think it is. I hope people walk away with a deeper understanding with what they’re doing when they’re doing a sporting event and with the capacity of sports to do good things for people. How does this project compare to those done by C+G in the past? Well in terms of exhibition design, this hits home for us. We’re based in New York. We were all around back at the time and all working in New York. We had to walk home on the Brooklyn Bridge or be stuck abroad during that time. And we’re New Yorkers. This is an honor to work on a project like this and we wouldn’t have it any other way. I think any other project is going to be different for that reason, we take all of our projects to heart and pursue them with passion, but this project was personal. “Comeback Season: Sports After 9/11” will run until next summer. Learn more about the exhibition here.